Logs are the most commonly used form of wood fuel in the UK, used for both open fires and wood burning stoves. Most people source logs locally, for example through tree surgeons, farmers or coal merchants. However some fuel suppliers offer nationwide delivery of logs either by the pallet or in large bags. It can be difficult to work out whether you are getting a good deal when buying firewood. Unlike coal and smokeless fuel, which must be sold in defined weights under the Weights and Measures Act, wood is usually sold by the bag or by lorryload. This makes it difficult to compare prices between suppliers. In addition, the performance of logs as a fuel varies a lot depending on moisture content and the type of wood. As a general guide hardwoods make better firewood than softwoods. Hardwood comes from slow growing broadleaf trees such as oak or ash, while softwood comes from fast growing conifers such as pine. While hardwood and softwood give out similar amounts of heat per kilogramme burned, a hardwood log can be up to twice as heavy as a similar sized softwood log. This means that to get the same amount of heat you would have to buy and store twice as much softwood as hardwood. Hardwood and softwood logs burn differently as well - hardwood gives a steady, sustained burn while softwood gives a quick surge of intense heat then dies down. This means that you will have to refuel your wood stove more often if you burn softwood. If you buy wood locally from tree surgeons or farmers it is likely to be green, with a high moisture content. Green wood can be bought at bargain prices, but you should be prepared to buy it well in advance of using it. If not already cut into usable logs, you will need to chop it up then stack it somewhere with good air circulation to dry out for up to two years. Seasoned logs have been air dried naturally over a long period until the moisture content has dropped to 30-50%. Wood with this moisture content isn't really ready yet for burning in a wood stove, but this is a good value option which gives you logs pre-cut to a standard size without requiring long storage times. Kiln dried firewood is first air dried, then the drying process is completed in large kilns to give an average moisture content of around 20%. Kiln dried firewood is ready for immediate use on your woodburner, and will give a good heat output and efficient burn. Wood waste can be tempting as an inexpensive or free source of fuel. You should never burn painted or treated wood (including MDF and chipboard) as this gives off chemicals which can be harmful to your health, your woodburner and the environment. Wood chips should only be used on a wood stove which has been designed to burn them. More and more people are becoming interested in wood fired heating as a way of reducing their carbon footprint. If you are looking into this option, try to find local sources of firewood such as managed woodland or untreated wood waste from tree surgeons. Fuel burned transporting firewood from your supplier to your home counts towards your carbon footprint, so the more local your supplier the better. Stores Direct have many years experience advising customers about woodburning stoves - please feel free to call us on 01484 434320 if you need help. 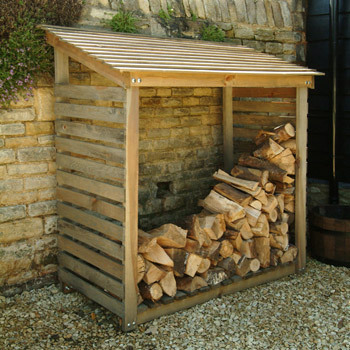 We also supply high quality firewood with nationwide delivery, as well as accessories such as the Garden Trading Log Store shown at the top of the page.